Cut the beef shoulder roast into large chunks, sprinkle with salt and pepper, then brown on all sides in coconut oil. Do not crowd your pan, you may need to cook in batches. 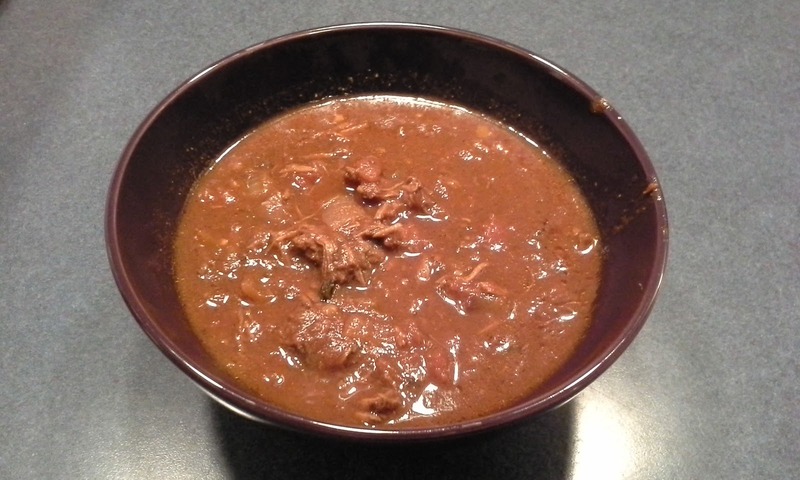 (I just put the browned chunks into the slow cooker as they were ready to save on dishes.) Don't wash the pan yet, it will be used in step 4. Turn the slow cooker on and set to low for 8 hours. Add the fire-roasted, chopped tomatoes to the slow cooker with your browned beef. Followed by the tomato paste and water, stirring to combine. Saute the diced onions and garlic in the your pan from Step 1. Cook until the onions are translucent, you may need to add some oil to prevent the onions from browning. In a small bowl, crush the oregano between your palms to release its flavor, then add the chili powder, cumin, cocoa, allspice, and salt. Combine with a fork, then add to the pan, stirring really well. Allow to heat through so that the flavors can start to blend about 1 minute stirring constantly then add to the slow cooker. Stir the mixture to blend. Cover and check it at 8 hours. After 8 hours, skim any foam or fat floating on the top of the chili. Using a potato masher, mash the “chili” to shred the beef it should come apart with little effort. Serve with the garnishes of your choice, such as cheese, sour cream, scallions, avocados, tortilla chips, rice, etc.